Pakistan's U.S.-allied president must resign before next month's elections or the country could risk slipping into civil war, opposition leaders and a leading independent research institute said Thursday. The calls came after the government pushed back polls to Feb. 18 from the planned Jan. 8 date due to unrest following the assassination of opposition leader Benazir Bhutto. Bhutto's death in a suicide bomb and gun attack plunged already volatile Pakistan deeper into crisis and stoked fears of political meltdown as the nation struggled to contain an explosion of Islamic militant violence. The government - which had initially ruled out the need for foreign involvement in the assassination probe - has been criticized over its security arrangements for Bhutto, who had claimed elements in the ruling party were trying to kill her. The party vehemently denies such a plot. Bhutto supporters have insisted that a U.N. probe would be the only way to reveal the truth behind her Dec. 27 slaying. They dismissed President Pervez Musharraf's announcement late Wednesday that Britain's Scotland Yard will soon join the investigation. "The mist of confusion will be cleared only if the regime accepts the party's demand for holding a U.N. inquiry into the assassination as was done in the case of Lebanese Premier Rafik Hariri's murder," said Farhatullah Babar, a spokesman for Bhutto's Pakistan Peoples Party. "The regime has lost all credibility. Neither a domestic inquiry nor vague foreign involvement ... would lay to rest the lingering doubts and suspicions," Babar said. The election delay also drew condemnation from Bhutto's party and the other main opposition group, led by former Prime Minister Nawaz Sharif. They said, however, that they would run in the polls anyway - seemingly a boost to Musharraf's hopes to engineer a democratic transition. 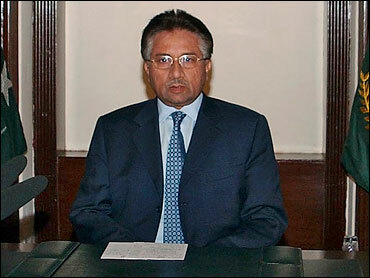 The opposition urged Musharraf to resign. "Free and fair polls are impossible under his leadership," said Javed Hashmi, a senior member of Sharif's party. "Such a thing is unthinkable if he is there." In a report on Bhutto's assassination, the Brussels-based International Crisis Group research institute called on the United States - which continues to support Musharraf - to recognize him as "a serious liability, seen as complicit in the death of the popular politician" Bhutto. "It is time to recognize that democracy, not an artificially propped-up, defrocked, widely despised general has the best chance to provide stability," the group's Asia director, Robert Templer, said in a statement accompanying the report. "Unless Musharraf steps down, tensions will worsen and the international community could face the nightmare of a nuclear-armed, Muslim country descending into civil war," Templer said. The White House expressed no objections Wednesday to Musharraf's government's decision to delay the elections, reported CBS News correspondent Mark Knoller. Musharraf, who took power in a 1999 coup, said in a television address Wednesday that he supported election authorities' decision to delay the vote due to riots that followed Bhutto's death. The violence killed nearly 60 people and caused tens of millions of dollars in damage. Bhutto - who the United States had hoped would enter into a power-sharing agreement with Musharraf after the elections - spent about eight years in self-exile, mostly in London, before returning to Pakistan in October to campaign. In his address, Musharraf announced that Scotland Yard detectives had been invited to join the probe into her slaying. He blamed Islamic militants for the death of Bhutto, a two-time prime minister, and appealed for public unity to combat them. "This is a time for reconciliation and not for confrontation," he said. Scotland Yard said it was sending a small team of officers from the Metropolitan Police's Counterterrorism Command. British Foreign Secretary David Miliband said the team would leave Britain by the end of the week. The White House said that it supported Scotland Yard's involvement, and that a U.N. investigation was not necessary now. "Scotland Yard being in the lead in this investigation is appropriate and necessary and I don't see - we don't see a need for an investigation beyond that at this time," said presidential spokeswoman Dana Perino. The opposition called for the vote to be held on time despite Pakistan's political upheaval, amid expectations that Bhutto's killing could give her party a sympathy boost at the polls.